Scaredy Kat & Her Own Crow: Snow for my buddy Bruce!!!! Snow for my buddy Bruce!!!! Hey Bruce, keep scrolling, theres some snow somewhere round this joint! 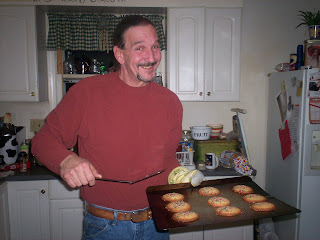 I wanted to post this picture for proof that real men bake!!! 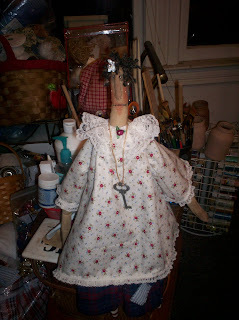 I wanted to show you a primitive friend that I had the pleasure of surprizing my friend Jody with in California. Shed been needing a smile and a warm fuzzy and so did I...aint nuttin more warming than pulling a fast one on someone ya love dearly. She special ordered a large doll for a Christmas present & upon delivery, Jody went bonkers over her, and promised as soon as Christmas was over, shed be ordering one for herself....she was funny, she took the doll to work, a meeting, and told me how difficult it was going to be mailing her off to her new home...So I went to work at the elf station and birthed this "Scaredy Kat FolkHeart"original. This photo wasnt taken on completion so the wings, halo and some embellishments like a red stuffed stitched heart with one of Jodys favorite inspirational quotes were added as well. Oh did she love it, she called squealing with delight. What a great reminder about how much fun it is having dear friends to love. Jodys so easy to love, she spoils me something wicked! She is one of my BFF&E! Yup got one at the ripe ole age of... um.....well nones yer business! 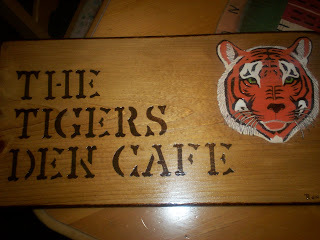 This wonderful woodburnt very large sign was made special by Ronnie for the cafeteria at the school I work at. The Tiger is their school mascot, so tomorrow when I bring it in, they are gonna love it! He woodburnt the entire piece & used slightly greased pencils for color. Then he stained it a light walnut and protected it with a satin sealer. 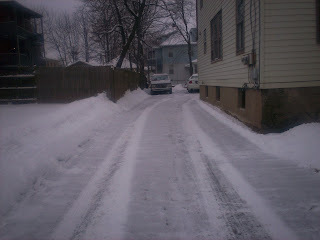 Then this large and looong driveway we shovel, well, maybe not "we" but rather "he" shovels! 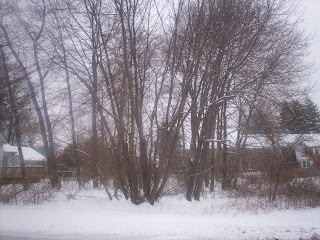 Well my friend from Texas asked me to PLEASE post him a piture of the recent snow we had, but in our "special forum" I cant post cuz my pics are too big & I havent yet learned how to minimize them...jeesh, diets, diets everywhere! SO here ya go Bruce!!!! and this stuff is ccccccold! 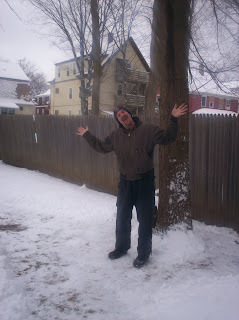 I was warm and toasty but made sure I came out to yuk it up for the camera for my Texas snow deprived friend. Im asking for my prayer warriors to keep me in prayers for the next couple of weeks, Im starting work tomorrow after some intensive training, and theres much paperwork, important responsibilities, working with large cash deposits, inspections, and Im also studying for the big state test Im taking on January 19th. All while prepping, cooking, serving, and training someone new for my cafeteria partner... While I try to retain everything I learned in my recent training. I am learning how to remain grateful, maintain peace, and keeping my eyes on the prize. I am not facing anything i havent prayed for...but Im learning how when overwhelmed or lacking confidence for serious responsibilites (in a short period of time) that blessings can feel like burdens. I know I cannot possibly do any of this alone. So I thank you in advance for those of you who have been in my corner. Also, I would be honored if anyone needs prayers to please leave a comment. We all know the power in prayers. Im keeping my friend Thomas in my prayers as he prepars to say goodbye to his precious Mom soon. 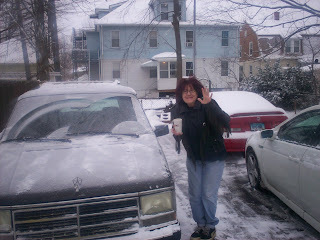 Hi Kat...LOVE all your pictures....my Sis is in RI too and I haven't heard how much snow she got yet. We just got rid of all ours...now it's back to just rain....oh well. Love your dolly....such a great friend you are!! Kat, your snow pics are great. 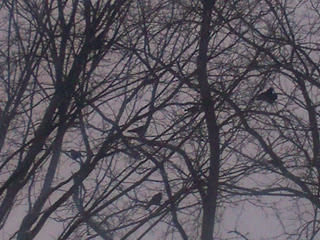 and I love pics of crows in trees! Hey, I can't wait to hear how everything turns out with your job and the testing. I'm on my knees for ya dearie. By the way, stop by my blog. I got an award for you to pick up. I am sorry if I embarrased you Kat. That was not my intention. Just missed you, that is all. 2009 I CLAIM TO BE MINE!!! !